Singapore, 28 August 2017 – As the final preparations for Vitafoods Asia round off, Informa Exhibitions looks forward to welcoming trade professionals to discover, learn, and network at Asia’s only dedicated event for the nutraceutical, functional food and beverages, and dietary supplement industries. From 5 – 6 September, uncover the latest innovations and key developments that will impact industry and product development at the Sands Expo and Convention Centre in Marina Bay Sands, Singapore. According to United Nations’ Economic & Social Commission for Asia and the Pacific (ESCAP), about 60% of the world’s population of older persons, defined as people at 60 years or older, live in the Asia Pacific region. Population ageing is happening at an unprecedented pace because fertility rates have been declining rapidly, while life expectancy has improved tremendously. In fact, the number of older persons in Asia Pacific is expected to more than double from 547 million in 2016 to nearly 1.3 billion by 2050. Attendees interested in healthy ageing platforms can learn more at the Life Stages Theatre and Market & Trend Overview, or explore relevant product offerings at the Inspiration Showcase and Tasting Centre. This year, with the support of the International Probiotics Association (IPA) and sponsorship of DuPont Nutrition & Health, Vitafoods Asia presents the Digestive Health and Microbiome Summit as part of its Conference programme. The Asia Pacific region accounted for an estimated 38% majority share of the global probiotics market in 2016, and the rise in consumer awareness of health benefits from probiotics, coupled with the sheer size of this market segment, signals more growth opportunities in the foreseeable future. Visitors who wish to explore the potential of this growing sector, to pick up best practices in product development, or uncover the latest R&D updates, can sign up for the one-day summit on the Vitafoods Asia Conference page. Yet another hot topic that will receive attention at the upcoming edition of Vitafoods Asia is the area of personalised nutrition. According to Herbalife’s Asia Pacific Balanced Nutrition Survey, one in three consumers here are keen on personalised nutrition products and nutrigenomics. However, due to a lack of practitioners in the region, such products have generally been too costly for consumers. At the Innovation Theatre, a panel of experts from around the world will discuss the increasing interest surrounding the topic, and the commercial viability of creating personalised nutrition products. Innovation trends and various degrees of personalisation will also be explored, opening opportunities for nutraceutical businesses keen on entering this market. Industry professionals keen on attending the show can pre-register on the website. 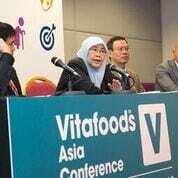 For more information on Vitafoods Asia, visit www.vitafoodsasia.com.